Each of the teams in the World Cup quarter-finals in Russia will fancy their chances of winning the tournament, goalkeeping great Peter Schmeichel said after England completed the line-up with a dramatic penalty shootout win. England defeated Colombia 4-3 on penalties in Moscow after the scored finished level at 1-1 following extra time. The win booked a quarter-final spot for England against Sweden in Samara on Saturday. The other quarter-finals feature France against Uruguay, Brazil versus Belgium, and Russia against Croatia. “You’ve got Brazil who are not firing on all cylinders… you’ve got Belgium who are probably the second best team, but probably the best-performing team was France, they stepped it up a bit [in their last 16 game,” the former Danish international said. “I have no idea, no inkling of who is good enough to go all the way,” he added. England booked their progress with their first-ever World Cup penalty shootout win, after suffering years of agony in the format. Harry Kane had given them the lead from the penalty spot during the second half of normal time when he was wrestled down, but a late Yerry Mina header equalized for Colombia. Schmeichel said that the action that preceded the tense finale wasn’t a classic. “It wasn’t a great game… England got the penalty, [Harry] Kane executed like he always does. Schmeichel said England should be wary of their last eight opponents Sweden, who knocked out Switzerland 1-0 earlier on Tuesday. “[Sweden] hammered Mexico 3-0… the mental toughness of the Swedish team is incredible, we’ve seen that time and time again,” Schmeichel said. But he also had praise for England’s mental fortitude after coming their shootout drama. England manager Gareth Southgate has given particular attention to spot-kick practice in training, which appears to have paid off against Colombia at Spartak Stadium. 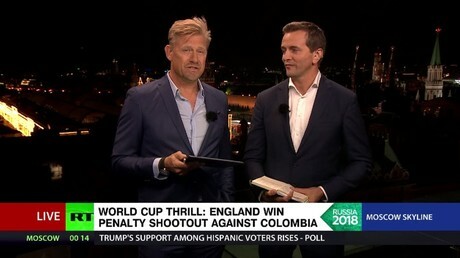 Schmeichel said that practice was all well and good but that nothing could prepare players for the pressure cooker of a shootout at a major tournament. “It worked today… but what you cannot practice, you cannot practice pressure. You can’t take penalties under pressure in training, it’s impossible. Lucky or not, England will now progress to a World Cup quarter-final for the first time since 2002.